The activation of macrophages prior to inhibition of tumor-expressed CD47 has been found to dramatically increase tumor shrinkage in mice. Stimulating macrophages to effectively target and destroy cancers has long proved difficult to achieve. 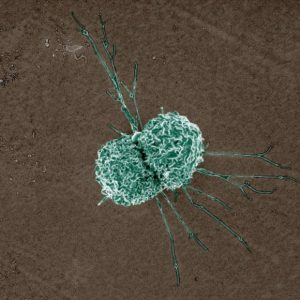 Researchers, led by Gregory Beatty at the Abramson Cancer Center (PA, USA), however, have identified a technique to alter the metabolism of macrophages, enabling the successful phagocytosis of cancer cells. Macrophages are highly prevalent in cases of cancer and yet they are often the most likely immune cell to be tricked into ignoring cancer cells or even in assisting their growth and metastasis. This is commonly achieved by cancer cells expressing the surface protein CD47, which inhibits phagocytic activity when it interacts with receptors on the macrophage. In light of this information attempts to activate macrophages against cancer have previously focused on inhibiting CD47, but this has proved inadequate to encourage phagocytosis of malignant cells. Testing an alternate approach to the problem, the research team first activated macrophages in mice using CpG, a toll-like receptor agonist, and then used the CD47 inhibitor to target the cells to cancers. This resulted in a decrease in tumor burden and prolonged survival of the test mice, even in cases where cancer cells expressed high levels of CD47. To find an explanation for these results Beatty examined the metabolic activity of the macrophage cells. The research team found that when stimulated with CpG, the macrophages would begin to utilize glutamine as well as glucose as an energy source for respiration. This effectively increased the capacity of the cells to attack and engulf cancers, effectively destroying them. “Cancer does not shrink without the help of macrophages and macrophages need the right fuel to eat cancer cells and shrink tumors. To do this, a shift in metabolism is needed to steer the energy in the right direction. It is the metabolism that ultimately allows macrophages to override signals telling them not to do their job,” explained Jason Liu, lead author of the study. This revelation could impact a number of existing treatments, as multiple therapeutics for diabetes and cardiovascular disease bear an impact on the metabolism of macrophages. Little is known about how these drugs could assist or possibly hinder immunotherapy responses in cancer, highlighting a tantalizing topic for further research.